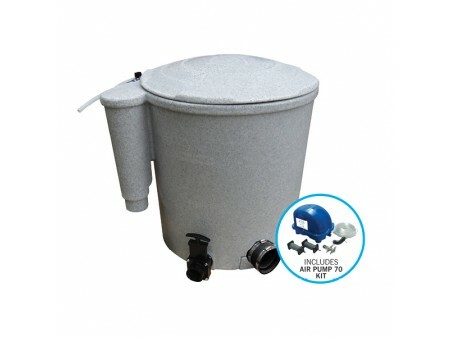 A compact member of the Nexus family the EazyPod is a mechanical and biological filter system for garden ponds up to 20000 litres or Koi ponds up to 10000 litres. The EazyPod utilises static K1 Media which provides enhanced biological benefits even when using the EazyPod solely as a mechanical waste filter. The EazyPod is available in grey or green colours and also can be supplied as an EazyPodAir with an Air Pump 70. It has has mechanical and biological filtration is very eazy to install and operate has a quick and eazy cleaning cycle works equally well pump or gravity fed is ideal as a filter on a quarantine system and is also ideal for use as a pre-filter polisher or on a skimmer line.